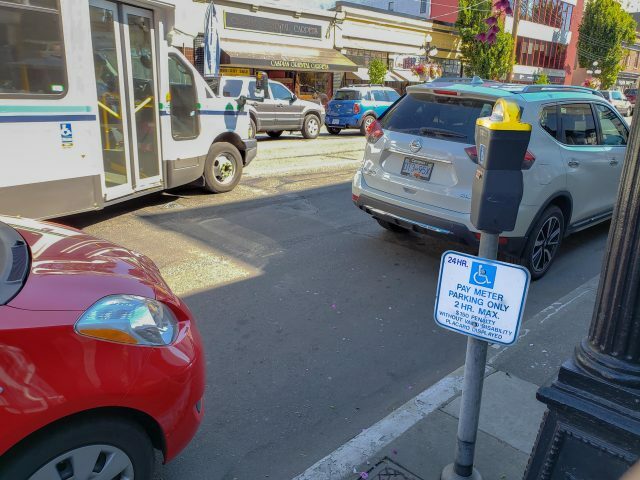 Per a 2018 report, only 50% of on-street accessible parking spaces in Victoria meet even a basic level of accessibility. According to a 2018 report by David Willows, only half of the 24 accessible parking spaces in Victoria meet a basic level of accessibility. In addition, the map indicating these spaces that is provided online by the City of Victoria is out of date and no longer an accurate guide to finding them. Authored by David Willows for the Accessibility Working Group, this detailed report on the state of parking in Victoria highlights how he perceives the standards of accessible on-street parking in Victoria to be inadequate for use by people with disabilities. He also explains how they lag behind the global trends towards increasing accessible parking in public places. Willows, a father who has children with disabilities, begins by explaining how accessibility helps everyone. He points out that it not only improves the quality of life for those with permanent or temporary disabilities, but also spurs economic growth. To read his full report, click here to download it as a PDF.